Spoiler Alert: Cinderella ends with the title character (Lily James) finally marrying a prince and there is some unbelievable plot device involving a lost shoe. If you have never heard the story before, I apologize for ruining it for you. But for those of you who are fans of the tale and are worried that Disney might update the story away from the orthodoxy it set out for the characters years ago and produce something dark and biting, rest assured they have done no such thing. Director Kenneth Branaugh plays it straight to the point where one wonders if he had a perspective to bring to the story at all. I will be honest. I don’t like Cinderella in her Disney form. She doesn’t do anything for me. I don’t mind “rags to riches” stories at all. It’s just that the character is so passive about changing her circumstances that I’ve never been convinced that she deserves to end up in a castle. I guess she beats Sleeping Beauty and Snow White in the passive heroine department in that at least the role doesn’t call for her to fall asleep. But when she is awake, she is too selfless for me to take her pain seriously. She outwits no one, does nothing to help herself, and were she not beautiful, no one would give her a second thought. I think she is the most overrated heroine in the canon, even though I understand why her tale is universally retold. 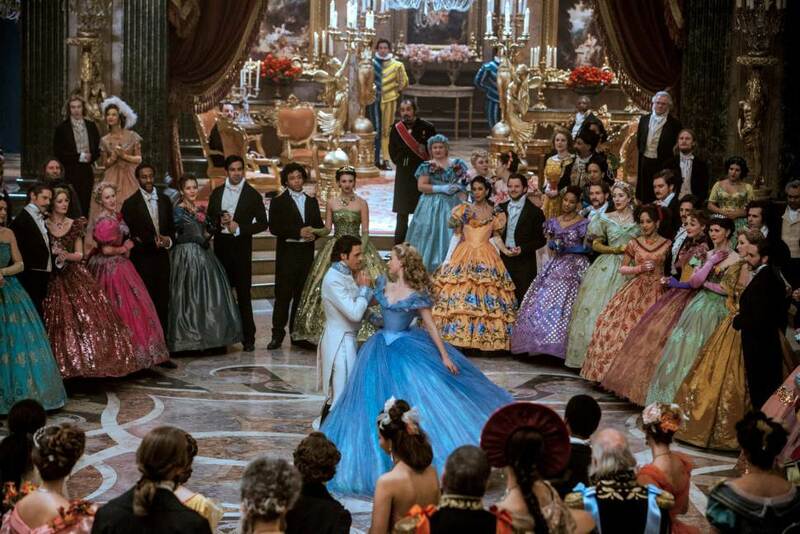 The entertainment value from Cinderella has always been with the other characters. How wicked is the step mother? How cruel are the step sisters? How silly is the fairy godmother? How much does the prince believe that true love can overcome class differences? You can vary these characterizations quite a bit. Unfortunately, Branaugh opted to do no such thing. So despite the fact that Cate Blanchette gives a cool reading of the step mother role, everyone else is fairly stale. She had the potential to be cruel, but really, we witness no more cruelty from her than making Cinderella do all the chores and sleep in a drafty attic. Yes, it is unfortunate that she prefers looking out for her own spoiled daughters than the good Cinderella, but she is more strict than wicked. The same can be said for Sophie McShera and Holliday Grainger as the two step sisters. They are simply spoiled and talentless, but in no way do they ever actually threaten Cinderella or threaten to lead the story in a new direction, say, by being nice to her or doing something other than mocking her. The net effect of this treatment is to give Lily James as the lead nothing to do but grin and take it, while never getting to the point where she decides for herself that she isn’t going to take it any more. The movie tries to convince you that she is that way because she is kind. I think she is that way because she is kind of weak. James is fine playing the vacuous part, but I couldn’t help thinking that any number of good looking actresses could be in the role. There is nothing there for her to do but wait for the inevitable end of the film at which time she appears to have learned nothing at all, but everything works out for her anyway. I would have respected her more if she would have tried to poison her family, or at least thought about it…but that isn’t the Disney way. That said, as far as children’s films go, Cinderella isn’t bad. The film is clearly targeted for the under twelve set, and given that there aren’t a lot of films released each year genuinely for this audience, I can give the film the nod for it’s high production values. The complications I desire probably aren’t wanted by the children it is meant for, so I’ve decided to offer two ratings for this one. The costumes, settings and CGI are splendid and the four star rating rating as a children’s film reflects that if I were nine, I’d be very happy with the film. But as far as adult fare, there really isn’t a reason to watch this very safe, not-really-updated, worn out tale. This entry was posted in movie reviews, USA and tagged 2015 movies, children's films, Cinderella (2015), Disney, Dramas, movie review, usa. Bookmark the permalink.